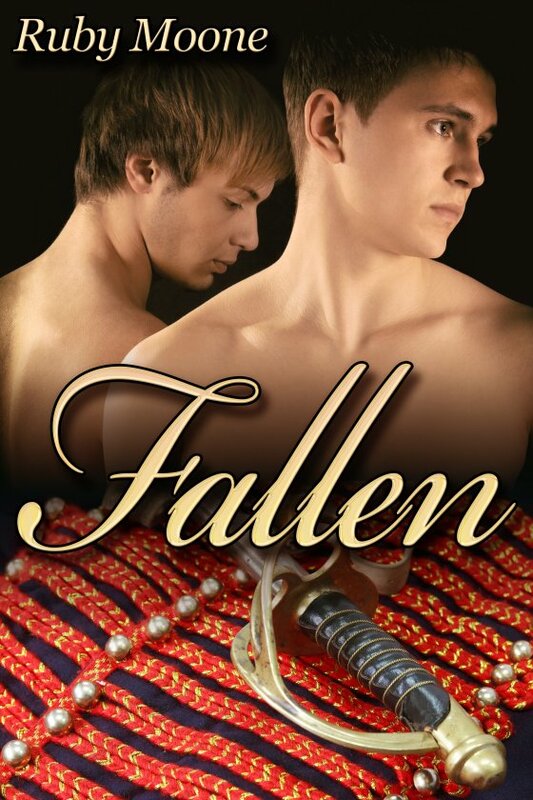 Today’s guest is Ruby Moone, whose first e-book Fallen was just published by JMS Books! Thank you for inviting me onto your blog. It’s great to be here. Fallen is my very first published work so I’m pretty excited about it. It’s a novelette set in London during the winter after the battle of Waterloo in June of 1815. I’ve thought for a long time about what it must have been like to be gay at a time when men could be hanged if found out. In a time when to be gay was a crime against God, nature, the King, and the state. I researched a lot about how, after the victory against Napoleon, ordinary soldiers were cast off with little money, no support for those injured, and unable to work. But at the heart of all this, I simply had two characters in my head who loved each other, were devoted to each other, but never even considered that they could be together, so they went their separate ways. Fallen is the story of how reaching rock bottom put them in a place where they dared to dream, dared to believe, and dared to love. A little bit about me? I live in the UK with my husband who is wonderful and puts up with me living in two worlds, the real world and the world in my head. He says he can tell when I am “plotting” because I tune out and go all glassy eyed! During the day I work in education, and when I do get some spare time, I love to read across a wide range of genres. I also love to cook, and am thinking about growing my own vegetables if I ever get a moment, but I find that walking is the best way to unwind and get creative. Writing has always been something I do, and I’ve always got a story and characters in my head. Recently I decided to get it together and send something off for publication, so in response to a submission call from JMS Books, I wrote Fallen, sent it off, and the lovely J.M. Snyder offered me a contract for it. The rest, as they say, is history! I’ve got two more novelettes coming soon, Summer Madness in August and The Heat of the Moment in September, and I am absolutely thrilled to have been able to contribute to the JMS Books anthology, Love Is Proud, to benefit the victims of the Pulse nightclub shooting in Orlando. Find Ruby online at the links below!